McCain: "With each failure our conscience is stung, and we resolve to do better"
WASHINGTON (CNN) -- Sen. John McCain said Thursday the United States must recover from the "moral failures" of human rights abuses and called for Americans to stand on the "right side" of history as a leader of the free world. 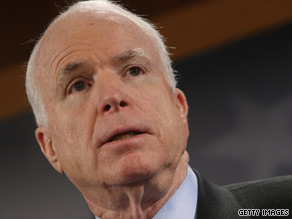 Sen. John McCain says the effectiveness of torture is questionable at best. "I believe American leadership in opposition to human rights abuses, not silence, is the truest expression of our national character," McCain said in a speech to the Junior State of America, a civics education organization for high school students. "The United States since its founding has embraced a set of moral duties, among which I believe is the obligation to respect the God-given dignity of every human being." The senator said that while America is by no means a perfect nation, failures such as the torture uncovered at Iraq's Abu Ghraib prison give the country a chance to learn from mistakes and do better in the future. "With each failure our conscience is stung, and we resolve to do better," he said. "Each time we say, 'never again,' whatever our flaws, whatever dangers we face, however sharp our debates, we must remain a country with a conscience." McCain knows firsthand about the horrors of torture. He was a prisoner of war in Vietnam for several years. He said the effectiveness of torture is questionable at best. "I will tell you, if you inflict enough pain on someone for a long enough period of time, that person is going to tell you anything that they think you want to hear in order to make the pain stop," he said. He said even if torture did elicit useful information that would help keep the country safe, the tactic is almost always wrong. "If you torture people, even if you might get information which is valuable -- and that is a real question amongst the experts -- then what does it do to our reputation and our image of moral authority?"